Posted: Sat Apr 16, 2011 6:01 pm Post subject: Re: Semi-Auto Shotgun "Test Drive"
why ain't you making a fuss over the safety on that Black Eagle being in the off position ??? P/S: That thing is ready to fire........."cond Zero" I think is the term you use !!! Sharp eyes, chambered, but I thought you had to have one in the chamber to be a zero. Posted: Sat Apr 16, 2011 6:43 pm Post subject: Re: Semi-Auto Shotgun "Test Drive"
Today was an interesting day. A friend brought his 12ga FN Tactical shotgun to the monthly pistol match and I teamed it up with the Benelli and Beretta. It is basically a tactical version of the Winchester SX3 sold by FN. I lucked out as a guy in the next bay forgot to bring slugs to sight in his new Mossberg 930. I had extra 12ga slugs, sold them to him, and got to shoot his Mossberg as well. I really liked the peep sight on the Mossberg (top picture insert). It 3" action was as smooth as all the others. Easy to activate the bolt release with the off-hand. Unlike the Beretta and Benelli, the Mossberg cycled a round into the chamber ever time the bolt was cycled. There is no button to hold/retain the rounds in the tube magazine but I think I can easily live without that feature. Basically the Mossberg worked just like a pump but you didn't have to pump. It had an 18 barrel and 7 rounds in the magazine. It was the same tube as all the other Mossbergs with an extension screwed on to it. There was no retention of the magazine spring when disassembled. The gas system was simple and effective. There was not capability to insert a threaded choke so it was just cylinder. This gun was not near as expensive as the others but shot as well in my book. Its worth considering. The FN/Winchester SX3 (3" chamber) is smooth and cycled a round through every time like the Mossberg. It has 2 different pistons - one for up to 1 1/4 ounce loads and a different piston for loads heavier than 1 1/4 ounce. He had the smaller piston installed so I could only shoot the 2 3/4 bird shoot and slugs with me. He asked me not to shoot the 3" buckshot because the action had malfunctioned before when heavy loads were used. It had a 22 inch barrel, a full-length 8-shot capacity magazine, and removable choke. The trigger guard seemed a little on the small side and might be hard to shoot with cold weather gloves on. Nice gun. No jams at all today with the Benelli or Beretta. I got all fouled up trying to do loading and cycle drills with them. Having a shotgun the cycles a round every time I cycle the bolt is turning out to be a must for me. When I ran the 3" buckshot through these guns, they became beasts!!! You could definitely feel the benefit of the Beretta's hydraulic shock absorber. But there was still plenty of recoil. I only but two 3" rounds each through both guns and decided I didn't need to shoot any more of those! I don't think I would want to shoot the 3.5" magnum loads!! This was a great experience. I may have to do it again. I find I don't like to pay any more than I have to to be functional or effective. The Mossberg 930 could be dual-role, functioning as a hunting and tactical shotgun while saving me money. However, I'm looking forward to shooting my 20ga pump at the matches for a while until I feel like I'm really at a significant disadvantage. Oh, I've also decided that 12ga semi-autos don't shoot softer than 20ga pumps. I think its just marketing. They might if the 20ga doesn't have a recoil pad. Now I have some guns to clean! Posted: Sat Apr 16, 2011 10:18 pm Post subject: Re: Semi-Auto Shotgun "Test Drive"
I thought so too !!! Posted: Sat Apr 16, 2011 10:21 pm Post subject: Re: Semi-Auto Shotgun "Test Drive"
Does the Winchester and FN have the "Speed Feed" like the Brownings ??? Posted: Sat Apr 16, 2011 10:34 pm Post subject: Re: Semi-Auto Shotgun "Test Drive"
have you seen the thumbhole stocks on the mossbergs? you get a 2 barrel deal here at the moment a 20" and 26" with chokes a ported external choke on the shorty looks like a mean machine. Posted: Sun Apr 17, 2011 5:47 am Post subject: Re: Semi-Auto Shotgun "Test Drive"
chambered, what is a speed feed. Is it just a magazine tube extension? Posted: Sun Apr 17, 2011 5:51 am Post subject: Re: Semi-Auto Shotgun "Test Drive"
Elvis, Mossberg doesn't sell a thumbhole stock over hear except as an aftermarket accessory. What you described would be a great combo pack. Posted: Sun Apr 17, 2011 7:41 am Post subject: Re: Semi-Auto Shotgun "Test Drive"
If you insert a round into the magazine with an open bolt the round automatically goes into the chamber closing the bolt behind it. You don't have to push the button and it actually gives better reliability to chambering the first round. Posted: Sun Apr 17, 2011 12:37 pm Post subject: Re: Semi-Auto Shotgun "Test Drive"
Nope, I haven't seen that "feature" on any shotgun. With all these shotguns, the magazine gates were locked with the bolts open. You dropped a shell into the ejection port and released the bolt. 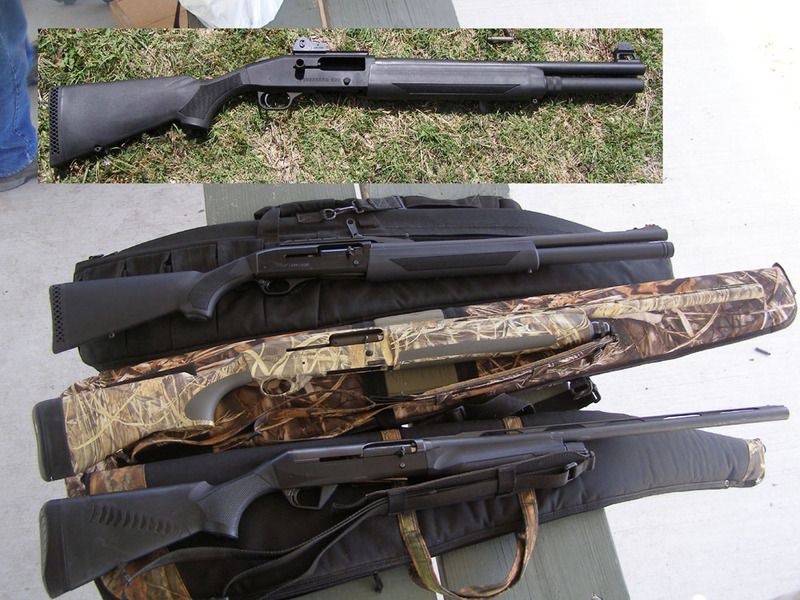 Posted: Sun Apr 17, 2011 12:45 pm Post subject: Re: Semi-Auto Shotgun "Test Drive"
Cleaning the Benelli and Beretta ws also a beneficial experience. Both came apart easily when the magazine end cap was unscrewed. I did the Benelli first. It was a really windy day when I shot on Friday and fine dirt had gotten into the action. The barrel along with the top receiver (one unit) came off along with the bolt. Very easy to clean and I had direct access to the trigger group. A couple of drops of oil on the guide rails and she was ready to go. The Beretta came about as easily, however, the first thing I noticed was all the powder residue on the bottom of the barrel and fore grip. There was a lot to clean up. I didn't find an easy way to remove the bolt and trigger group from the receiver so it didn't get as good a cleaning. Posted: Sun Apr 17, 2011 7:34 pm Post subject: Re: Semi-Auto Shotgun "Test Drive"
Well' if ya wanna start again: the thumb thingy on a 1911 is NOT a safety. It's a "manual safety LOCK". Pics of my guns- H&R, chamber open. Winny: safety on. Silm: called me night before and told me they are unloaded, pins removed, feed ramps welded down. So, I let it slide. P/S: a speed feeder is spring loaded tube of shells that rams a S/A's mag full in one gulp. Er so I've been told. Posted: Sun Apr 17, 2011 7:39 pm Post subject: Re: Semi-Auto Shotgun "Test Drive"
Hey, Slim, you pick a gun yet? Posted: Sun Apr 17, 2011 8:38 pm Post subject: Re: Semi-Auto Shotgun "Test Drive"
Posted: Sun Apr 17, 2011 9:10 pm Post subject: Re: Semi-Auto Shotgun "Test Drive"
Yeh, my Mossberg 20ga pump. Got my first tactical shotgun match with it next weekend. Returned the Benelli and Beretta, cleaned, with a loaf of bananna nut bread. It was a great experience but I need some more before I decide anything. Posted: Sun Apr 17, 2011 9:15 pm Post subject: Re: Semi-Auto Shotgun "Test Drive"
Not sure it is a feature I'd be interested in. I don't like bolts moving unless I release them.